Porridge has always been my favorite Breakfast and I eat it most days (even in the summer). 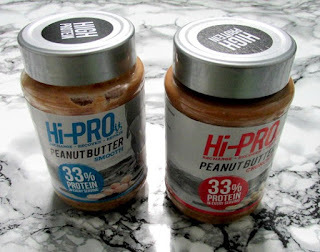 I was asked by the people behind the brand Hi-Pro if I would be interested in giving my diet a blast of protein with New Hi-Pro peanut butter. I've never taken to eating peanut butter before but as I had seen recently quite a few people are including it as part of a healthy diet I decided to give it ago. So far I've only been having it mixed in with my Breakfast each day as I know nuts are only healthy in moderation. I've noticed that on their website Hi-Pro have a good range of recipes to try out using their peanut butter and I'm thinking of giving the no bake peanut butter cookies a try. Hi-Pro contains 33% protein per serving (25% more than most peanut butters), Their tasty range of crunchy and smooth peanut butters has been specifically created for those who train or have a keen interest in health. I've only tried the smooth one so far and really like it. Unlike other brands,they don’t use soy or whey to increase the protein level. All the protein is sourced from peanuts, which means you’re only putting pure forms of essential nutrition in your body and it doesn’t affect the flavour of the product. Notably, the peanut butter is vegetarian and vegan friendly and has no added salt. Do you eat peanut butter as part of a healthy diet? If so I'd love to know some of the recipes you like to use. We do sometimes. We have peanut butter on toast. I am a big peanut butter fan. It just tastes so good. I have never heard of Hi-Pro before but apparently I need to look into it. I often like to eat apples with peanut butter as a dessert. Also not a fan of peanut butter but use it to make banana flapjacks, will look out for this brand as sounds so much better than the other brands. Thanks for sharing! I'm a massive fan of peanut butter! what a great idea :) we like having it on toast with jam :) yum! This looks like a healthier option! I don't like peanut butter but my family are obsessed with it! Looks like a yummy sweet breakfast. Never tried strawberries with peanut butter before. That looks yummy, I never know what to do with peanut butter other than on toast. in baking or to the dog as a treat lol. Now I know what to have for my breakfast tomorrow. I love my some peanut butter. I'm also big into my healthy brekkie so thanks for sharing this! I love porridge and I adore peanut butter so this would be the perfect combo especially since it has protein in! I love anything nuts and I love it crunchy peanut butter, not as part of healthy diet though, it is just because I love them. I love peanut butter, but the OH hates it so I don't use it to cook with. I like it with celery or apples, but at the moment buy it, and then it sits in the larder unused for months. I only started eating peanut butter couple months ago and I can't get enough of it.